This species' densest populations are found in large mid-elevation rivers flowing over cobble substrate. They give way to sister species at higher elevations in the headwaters and tributaries. The coastal states can see these hatches starting in April while the northern Rockies may see them well into July. As their emergence date approaches, they migrate into the shallows at preferred locations. When they are ready, they crawl out of the water onto exposed cobble or riparian plant life to split their husks and emerge. This usually takes place in the early morning hours but can also take place in the evening or even midday under cloud cover. 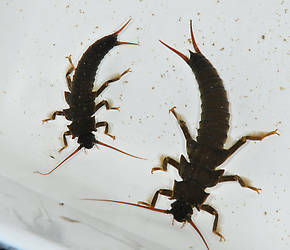 It is the ovipositing females that cause the bulk of the dry fly opportunity. Though some are known to land and lay their eggs, most gravid females fly low over the water in a lumbering flight path and drop their large pea sized olive black egg sacks from above. This method of ovipositing wouldn't normally present good fishing opportunities if it weren't for two other factors. They aren't the best fliers and the West's ever present breezes often knock them to the water. Sometimes they flop around on the surface for awhile, sometimes in softer water they will ride docilely with their wings folded. These are dense animals not designed for long floats stuck in the surface film. If uneaten, they will expire and sink rather quickly, though sometimes individuals will die with their wings fully spread, locking their bodies suspended under the meniscus a little longer. All of these scenarios are grist for the fly designer's mill. Pteronarcys californica nymphs develop for three years before emerging. This means that in the months prior to the hatch, there are three sizes in the river. After the hatch, there are only two. Angling author Charles brooks did a lot of snorkeling in their habitat and noted an interesting phenomenon. While the predaceous Perlidae nymphs could be seen constantly scurrying about in pursuit of a meal, the detritivorous salmonflies were hidden in crevices with only their antennae exposed for most of the day. Starting in the mornings often after first light, the first year brood would emerge en masse and graze for awhile before retreating back to their hidies. This was quickly followed by the second year brood followed last by the nymphs of the year. The entire process is again repeated in the evening. The mystery of the waiving antennea is intriguing. The simplest and most obvious explanation is they are sensing for predator activity, but some speculate this may be related to their synchronized feeding activity as well. The two colors used in salmonfly imitations are Dk. brown & orange in various shades. Depending on locale, the brown can vary from almost black to coffee brown and occasionally even gray brown. The orange can vary from almost yellow to a deep salmon red. Color can be important and anglers who only have the ubiquitous black and hot orange shop flies can be at a serious disadvantage. 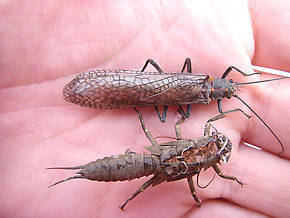 Nymphs should be carried in three sizes to simulate the three years of development and in two styles. Simple and impressionistic patterns for fishing deep in heavy water (anglers will go through a lot of these) and lighter more imitative flies for the softer margins. Sizes run from 3XL #2 to #10 depending on the strain & brood. The anglers selection can be trimmed down by the fact that the nymphs of the year are either non-existant or in the shallows during the fishing season so the big deep ones can be left home, especially after the hatch. Conversly the smaller flies used for prospecting are usually fished deep in the runs so the shallow imitative designs are often unnecessary. Heavy water requires bushy stimulator/sofa pillow designs or a lot of foam, unless the angler is willing to go wet (a strategy often much more successful). The egg-laying females can make a great deal of commotion and imitations should be fished accordingly. Sometimes slapping them down with a splat and twitching them around like you would a grasshopper pattern is just the ticket. Other times they will be placid and the fish will want them dead drift. This is especially true in the softer margins that often call for flush floating highly imitative designs. The hatch often occurs during high water (just after peak) so you sometimes have limited visibility during the hatch. Also - I believe that they can occur above 7000 feet. I don't have many reliable sources about this species, so it'd be great if you western fishermen could read over the article and make sure I haven't said anything stupid or omitted anything important. I'll be happy to incorporate any additions you have.